In the 1930's and 1940's Universal pictures produced and marketed a whole slew of wildly popular horror starring film stars such as Bela Lugosi, Boris Karloff and Lon Channey, but by the 1950's American audiences grew tired of the "Classic Monster." American audiences now preferred horror and sci-fi films about giant spiders, atomic colossal men and aliens from outer space. In America classic monsters were now being put in comedy films, with Bud Abbott and Lou Costello. Although this produced some successful and in my humble opinion, some of the funniest films ever, many still argue that this may have tainted the image of the classic monster. But Mexican audiences still clamored for the classic Universal monsters, Dracula, The Frankenstein Monster, The Wolf Man, and The Creature from the Black Lagoon. So starting in the 1950's Mexican movie studios began to make there own versions of the Universal monsters. The best example of this would be seen in the 1957 film "El Castillo de los monstros" aka "Castle of the Monsters" in which they manage to place Dracula, the Frankenstein's monster, the Wolf Man, The Creature from the Black Lagoon and the Mummy in one film. For those of you not familiar with Mexican cinema it is much different then it's American counter part. Movies made in Mexico were made for everyone to enjoy, so every element was thrown into a film, horror, action, romance, suspense, music and comedy. So the producers figured adding Mexico's favourite stars of the Lucha Libre would logically be the next step. The star they chose to lead the way, El Santo De Enmascarado de Plata (The Saint, The Man in the Silver Mask). El Santo was always true to Lucha tradition and never appeared in public with out his signature silver mask, even when he goes to the store! 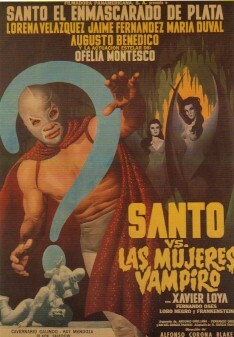 El Santo was pitted against a wide array of monsters and villains such as Zombies, Dracula, the Wolf Man, crime rings, Vampire Women, diabolical hatchet men, and Mummies. The films not only contained the standard film elements, but in films starring Luchadors they added a new element…wrestling. The Lucha Film contained on average 2 wrestling matches, even if there was no rhyme or reason for the match to be in the film in the first place. The matches contained moves that in America, at the time, were unheard of in the 1950s and 1960s. Suicide Dives, Senton Bombs, crossbodys to the outside from the top (Santo Dive), and upside-down surfboards where all common place in the Lucha film and at Lucha shows through out Mexico. Films staring El Santo became wildly popular in Mexico so more masked superstars were added to films alone and partnered up with each other such as Mil Mascaras, Blue Demon, El Tinieblas, and Hurricane Ramirez. They all had one thing in common they were pitted against classic monsters, their films contained every film element and had wrestling bouts in the film. Lucha films became so popular that there was also a "Wrestling Women" series of films made the stars of the films were actresses who used body doubles for ring work, who fought crime rings, Mummies, and Aztec Apes. But by the 1970s the Lucha film had lost its luster, ticket sales began to decrease, and by late 1970s the Lucha film was dead. The exception being the occasional El Santo film being made though out the 1970s and 1980s but the films did not enjoy the success they once did. Sadly in February of 1984 the great El Santo suffered a heart attack and died. In true Lucha tradition he was buried with his mask on, carrying it to the bitter end. With the advent of cable, as early as the 1970s in American television was looking for content to place on late night TV, Horror films where the logical choice for late night television. So during this time several Mexican Horror, Lucha, and wrestling women films were purchased dubbed and placed on television. This started a cult following for the Lucha film, and new generations of El Santo fan emerge. Although the majority of Lucha films are not dubbed in English, and are not with sub-titles, fans of the Lucha film that may or may not understand a world of Spanish watch anyway. Places to find the coveted Lucha Film!